California offers subsidized child care programs to help working poor families with babies afford childcare. Yet less than 14% of eligible infants and toddlers in California lower income working families have access to subsidized child care. Additionally, the standard state reimbursement rate for child care providers, is exceptionally low and inadequate to fully fund high quality child care and development programs. There is an incredible need for new and updated state preschool program centers. The cost associated with opening new facilities often deters them from happening, further contributing to the shortage of care. California legislators introduced AB 2292 to increase the state’s capacity to serve babies and toddlers in high quality early child care programs. Funds startup costs. The bill funds start-up costs for new inclusive early childcare centers and helps renovate existing child care facilities. 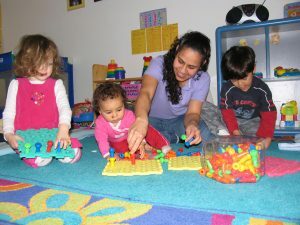 Helps childcare centers serve more children. AB 2292 increases the reimbursement rates for infant and toddler care. Recruits a new generation of childcare providers. AB 2292 expands funds for targeted outreach, recruitment, training, supplies and resources for startup costs to recruit child care providers. You can now support AB 2292 – within seconds – on the Click My Cause Two-Tap App. Sign up for mobile alerts on AB 2292 from Equal Start. Every time AB 2292 is up for vote, Equal Start will send you a mobile alert. Then, voila!